What are the Renter Qualifications for renting your vehicles ? All reservations are made subject to the renter being able to comply with the terms and conditions of our Rental Agreement, which must be entered into on pickup of the vehicle. We’ll need to see the Driving Licence of any person wishing to drive. AutoRent vehicles may be driven only by renters aged at least 21 years of age and the driver needs to have held a current licence for at least 3 years. Drivers must present a licence issued in English, or a Driving Licence with an accompanying certified English translation, provided by a Consulate or other authorised body, or a current International Driving Permit. Drivers must hold a full licence; provisional licences are unacceptable. Who can drive the vehicle ? Only those who have shown us their driving licences and been accepted as a renter or joint renter may drive. Don’t let anyone else drive; otherwise, they’ll be responsible for all damage to other people’s property and you’ll be responsible for all damage to our car. Why do I have to pay a Location Fee some locations but not elsewhere ? What is Vehicle Registration Recovery ? What is Administration Recovery ? Can I take the vehicle out of Tasmania ? Vehicles may not be taken out of Mainland Tasmania without prior written agreement. It’s permitted to utilise the vehicle on Bruny Island. Why do I have to pay for damage if it wasn’t my fault ? It’s the same as it is with most private vehicles. You pay for the first so many dollars of any loss or damage until this can be recovered from the other driver. If our insurance company is able to recover our costs from the other driver, then we’ll reimburse you for the amount we’ve taken from you (however this may take 6 months or more). What about windscreen and tyre damage ? Windscreen and tyre damage are treated in the same way as any other vehicle damage. You’re responsible up to the limit of the liability amount stated in your Rental Agreement. We’ll repair windscreens if appropriate and replace them where absolutely necessary. A damaged tyre will be charged pro rata to the measured tread e.g. a tyre with 75% remaining tread would be charged at 75% of the new tyre charge. If you buy a replacement tyre, its type, make and rating must match the existing tyres. What does fair wear and tear mean ? Can’t I travel on unsealed roads ? We aren’t saying that you can’t travel on unsealed roads, just that they’re much riskier than sealed roads. So, if you can’t avoid unsealed roads, slow right down and take extreme care. (A higher non-reducible liability applies if there’s any loss/damage/accidents on an unsealed road). Are there any places we can’t take our vehicle ? The vehicle is permitted to be used on made roads only. It’s prohibited to use the vehicle off road, such as cross country, bush tracks or on beaches. If you ignore this prohibition you’ll be liable for ALL damage to the vehicle and will not be provided with a replacement vehicle. Are there any roads we can’t drive on ? What if I break down ? Emergency help is available 24 hours a day, every day of the year, via the Royal Automobile Club of Tasmania’s Roadside Assistance. What if I get back early ? A refund may apply. Your rental will be re-costed to take into account the earlier return but, if the original rental rates were based on a longer duration, higher charges might apply to the now shorter duration. What if I want to keep the vehicle longer ? Provided that you call beforehand and pay in advance, we’ll extend your rental if your vehicle hasn’t been reserved for someone else. If you’re paying by credit card or charge card, we can debit your card account with the cost of the extension but if you’re paying cash you’ll need to call in to our nearest rental location to pay the additional charges in advance. Is there a penalty involved if I cancel my reservation ? Some rates and vehicle types require a guarantee and may have a cancellation penalty associated with the reservation. Generally speaking though, unless you’ve been required to pay a deposit or the full amount in advance, reservations made through this site do not have any penalties - for camper rentals please see the “FAQs - Campers” pages. Where a penalty may apply, details will be displayed on screen. I made a reservation through my Travel Agent; can I change it online ? No, you will need to ask your Travel Agent to change the reservation. Can I change or cancel my reservation online ? Yes, if you have made the reservation via this website. Otherwise, you’ll need to make the changes in the same way you made the reservation. Can I pre-pay my rental costs on this website ? The only payments that may be made via this site are those where a mandatory deposit or pre-payment is required. Will I get my deposit back if I return the vehicle full of fuel ? Yes, if the car is returned in a condition consistent with normal wear and tear, and has not been used away from a made road. Do I have to return the vehicle with a full tank ? Fuel is not included in the rental rates. You pay for fuel which was supplied at the start and used during the course of the rental, but the tank doesn’t have to be full when you return it. What is Fuel Purchase Option ? Fuel Purchase Option (FPO) give you the option of pre-purchasing a full tank of fuel at a discounted price, and means you can return with the tank as empty as you feel comfortable with. This saves you both time and money at the end of your rental. We won’t give you a credit for any fuel left in the tank, so the less fuel remaining, the more you save. Customer feedback indicated that refuelling at the end of the rental was time consuming, and this option allows you to settle fuel costs at the start of the rental. Can baby seats be fitted in minibuses, campervans and motorhomes ? Yes, both the 8 and 12 seat minibuses allow the fitting of child restraints. Our 4-Berth Campervan with high roof has 1 anchor point in the rear, our 2-4 Berth Motorhome with shower/toilet and optional awning has 2 anchor points in the rear, our 2-5 Berth Twin Cab Motorhome with shower and toilet has 3 anchor points in the rear cab and our Luxury motorhome has 2 anchor points in the rear. There are no anchor points in our 2-Berth Camping Wagon or our 2-Berth Motorhome without shower and toilet. No, our terms and conditions prohibit the carriage of any pets, whether contained or not. Licenced Guide, Hearing and Assistance dogs are allowed, please advise our staff when making your reservation. We have extra luggage. Can we fit a roof rack ? No, under our terms and conditions, nothing may be fitted to the vehicle. I want to tow my trailer - is there a towbar ? Towbars are not fitted to cars, motorhomes or campervans, and under our terms and conditions may not be fitted to vehicles. There is one exception; our 12-seat Commuter Minibus is fitted with a towbar and a trailer may be towed. Luggage trailers are available for hire. Click here for the full list of additional items available for hire. Once you’ve made your reservation online, contact us to add a trailer. You can also tow your own trailer. Are snow chains available and can they be fitted ? The Terms and Conditions of our Rental Agreement prohibit the fitting of any item to the vehicle. Do I have to wash the vehicle; is there a cleaning fee ? Generally no, but the Rental Agreement does allow the application of a fee where the vehicle’s bodywork was unusually dirty, covered in bitumen etc. or the interior was in such a condition that carpets or seats had to be specially cleaned, and so on. Can I enrol in the Hertz # Club Gold program online ? Yes - click here to go to the Hertz website. Where can I find a map of Tasmania ? Click here for Tasmanian Map. What are your Rental Terms and Conditions ? Can I hire a GPS navigation system ? Yes, the Hertz Neverlost system is available for hire. Click here for the full list of additional items available for hire. Can 12 seat minibuses be driven on a normal car licence ? What if I’m a few hours late returning my rental ? Usually, charges are calculated on a per 24 hour basis. A grace period of 59 minutes is usually allowed but extra charges apply from then on. These extra charges apply not only to the vehicle but also to optional extras like the Liability Reduction Fee and sundry items such as baby seats. What if I return after your depot is closed ? An after-hours key drop option is available at all depots. The vehicle will remain your responsibility until it has been checked the next day by our representative. Extra charges will apply if the grace period has been exceeded. Are one-way rentals available; is there an extra charge ? One-way car rentals between our state-wide rental locations are available. One-way fees will be assessed at the time of booking. Some restrictions may apply at peak times. Is there an additional charge if there’s more than one driver ? No, there’s no charge - all we need is to sight a valid driver’s licence for any person wishing to drive. Can the vehicle be delivered to my motel ? We’re unable to deliver to your accommodation because we need to process your credit card at our office. We need you, plus any other driver, at our office so we can record credit card and licence details. What if I have to cancel my reservation ? It’s important that you know about our policy regarding cancelled reservations and the refund of any monies paid. If the vehicle is returned early for any reason other than one requested by us - no refund. We also reserve the right to refuse provision of a replacement vehicle in the event of an accident and in some instances you may not receive a full refund of unused days. Can campervans and motorhomes be driven be driven on a normal car licence ? For Australian License holders, yes. Some International licenses restrict the weight of the vehicle you can drive, please check your license against the vehicles weight when booking a Motorhome. My flight doesn’t arrive until late, can I still collect my camper ? Is there any extra charge if we all want to drive ? Is a campervan or motorhome difficult to drive ? Campervans are very similar to a car to drive. Over many years’ experience we’ve found few drivers who haven’t easily adjusted to driving the larger motorhomes. A fee will apply to all one-way rentals commencing at Hobart Airport or our Launceston Campervan Depot. For rentals starting at Devonport Airport, Devonport City or Devonport Ferry Terminal, a Repositioning Fee will apply. This fee does not apply to drop-off at Devonport. Can’t we rent a motorhome or campervan for less than 6 days ? Usually, our minimum rental is 6 days, although we do have lesser duration rentals from time to time. You may make a rental for less than the minimum rental period but the rate applicable to the minimum duration will apply. Need to contact us? Click here to enquire. Do you have automatic campervans and motorhomes ? Yes, all of our Campervans and Motorhomes are automatic. With our camper, do we have to stay overnight in caravan parks ? No. 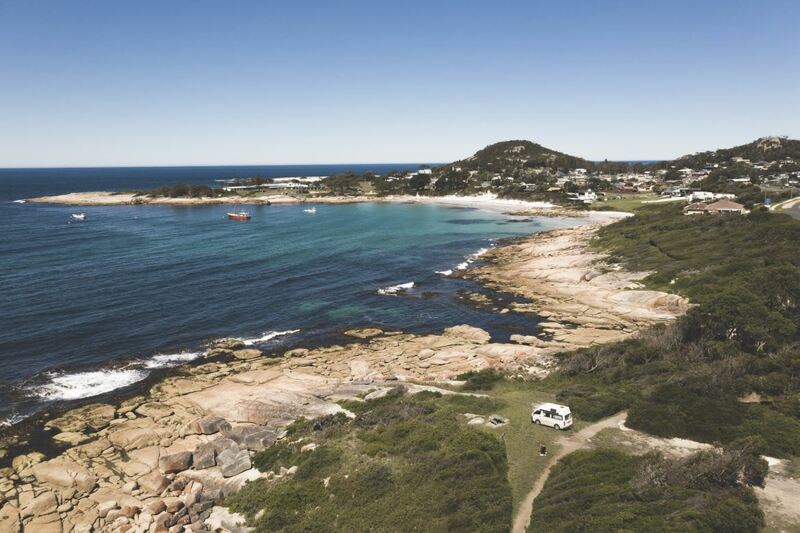 Although Tasmania has many comfortable camping grounds and caravan parks, there is generally no restriction on where you can stay overnight, as long as the van is well clear of the carriageway, and there are no signs to the contrary. Even though our vehicles have a twin-battery system to minimise “flat batteries”, they do need re-charging at regular intervals (e.g. over long driving periods or overnight charging at a powered site). How much does it cost to stay overnight at caravan parks ? Can we store luggage at your depot while we’re renting ? Luggage can be stored at your own risk, and providing you’re returning to the same location. We’ve made some provision for luggage in our campervans and motorhomes, but you’d have some problems with storage of large suitcases - we suggest small suitcases and soft bags. In your own interests, please don’t leave items of value on view while you’re away from the vehicle. Is it safe to drink the water from the vehicle’s water tank ? Can the children travel in the back of the campervan or motorhome ? What additional items are available for hire ? Click here for the full list of additional items available for hire. How do I book a commercial vehicle ? Select the vehicle that best suits your needs from the commercial vehicles page, then contact us to make your reservation. Can your trucks be driven on a normal car licence ? Are one-way rentals available and is there an extra charge ? Subject to availability one way rentals between Hobart, Launceston, Devonport and Burnie are permitted, a repositioning fee will apply. No, vehicles may not be taken out of the state. Do any vehicles come with a power Lift ? Our Easy Movers include, free-of-charge, a labour-saving power-lift. Wheel your heavy fridge, washer, etc. on to the platform and effortlessly raise it to truck level. Lift up to 500kg. Do you provide ropes, blankets and boxes ? Can I hire a trolley for heavy items ? Trolleys can be hired from some locations, please ask for availability when making your reservation. Can I use the vehicle for commercial purposes ? Yes, you can use AutoRent to handle an overload, to meet an emergency or just to operate ‘lean’ - make sure you don’t pay for under-utilised equipment. Are long term hire rates available ? Yes, please ask for a special quote.